This top depicts an obake (monster/spirit). In Japanese folklore, obake (or sometimes bakemono 化け物) are types of preternatural creatures similar to monsters or spirits that can take many forms. Their main characteristic is an ability to transform. They sometimes disguise themselves as humans (though their true form may be an animal such as a fox or cat) or can be normal household objects that transform themselves into demonic creatures (see tsukumogami). They are distinct from the spirits of the dead, although sometimes ghost-like apparitions can be called obake or bakemono. This top is designed so that when you use a string to wind up the top and spin it, it looks like the spooky obake is staggering about. Hiroi Michiaki: This is an obake (monster/spirit), right. Paula Curtis: Yes. [Top] number twelve. 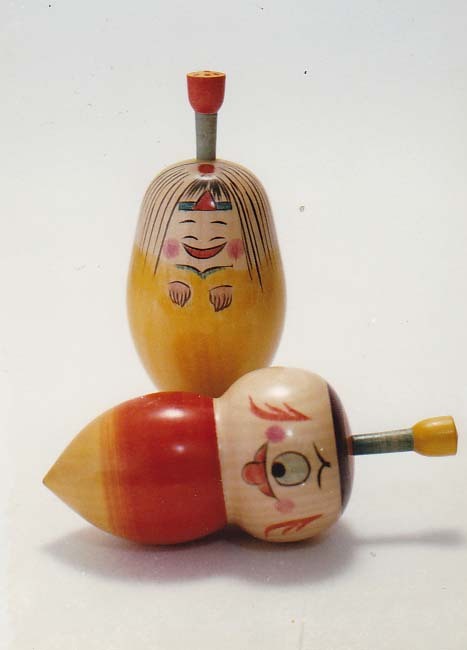 Hiroi: This one, as you can see, when you spin it, the obake staggers about. Hiroi: When you wrap the string around this one, too, and zip it off, it goes around like this, lolling around as it spins.